One of the fields where vintage palmtops can easily compete with modern gadgets, is adventure gaming. I mean those games where you type "examine box" and the computer tells you that there is a small piece of paper inside. Or something else. A lot of games were written for portable computers in the heyday of adventure gaming (80's and the beginning of 90's). If you don't know, what these "adventures" are about, read the excellent introduction by Joe W Aultman or an exhausting beginner's guide at Brass Lantern. With these machines you can access all Infocom titles (.IDF format) thanks to the ITF Interpreter by Bryan Scattergood. 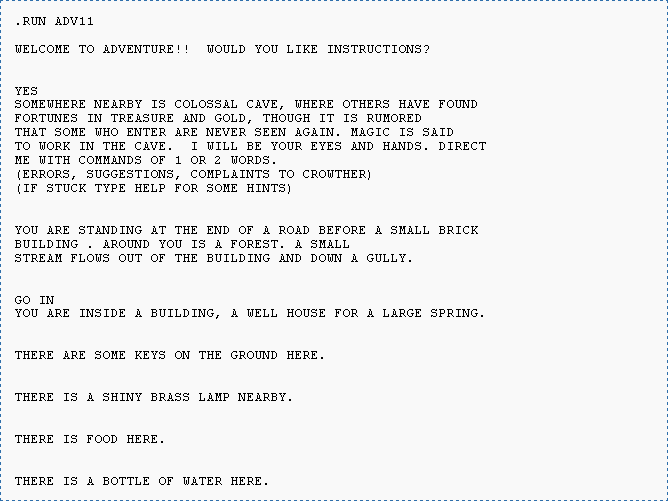 You can download it as well as Zork I from BioEddie's. There are a few amusing adventure games available from Tim's Amstrad NC Users' Site, like "Crystal of Nebumeth". NC's full-sized keyboard and large screen make it really comfortable to play adventures even for a long time. Amstrad has a BBC BASIC interpreter built in, so new games may be easily written (the source codes of existing games may help you get started). You can download a few games from atari-portfolio.co.uk. I don't think that any DOS Z-code interpreter would run on a Portfolio, but I didn't even try. Maybe there is a lightweight version, capable of running on a very basic XT? EDIT: There is an interpreter with a few games (including Zork Trilogy). You can download it from PofoWiki's download section (infocom.zip). There are some titles on the S.U.P.E.R. site. You need to be patient, though, and click through those hundreds of programs listed (no categories). DZip (16-bit DOS version) should run on every LX (most likely on 200LX). There are a few Z-code interpreters for Palms, like Pilot Frotz or Pilot Zip, but I've used only one of them - Frobnitz. It supports all Z-code file formats (except V6) and is quite powerful, but larger games are slow like hell on my IIIe. I’d love to see a good comparison of the HP LX palmtops, and which one is the best to own, given that one doesn’t need 1-2-3 and such. The goal is a battery powered DOS (even legacy dos) system; with a descent keyboard (sorry ipad-ers). A comparison… Right, you got it 🙂 In a few months I’ll try to write something like that, maybe including Atari Portfolio. In February I created a version of “Flappy Bird” for the Psion Organiser II. It’s called FLAP and is not very good but can be downloaded here: http://dl.dropboxusercontent.com/u/12124596/Software/FLAP.zip . The OPL files are the actual listing and the others are object files for execution if you don’t want to build it yourself. Cool 🙂 If you want to, I’d be happy to place it in my Download section.